This weekend I went did some training in the Lake District. We drove up to Keswick on Friday night and stayed in a hotel, which will be a world apart from the actual event where we will be staying in a tiny lightweight two-man tent. We had breakfast early on Saturday morning and then drove out to the start location, about 15 miles from Keswick, at Fell Side. Fell Side is about 4 or 5 buildings on a very narrow country road. The weather was forecast for rain all weekend, so we dressed in waterproofs straight away. Below is the map of the area. The red line is the route we actually did, and includes the 4.5 mile run/walk back to the car after reaching the "Overnight camp" location at the end of the days effort. The blue line was the other option that we decided not to do. If the map looks a little unfamiliar it is because it is a Harvey 1:40k map, and not the usual Ordnance Survey 50k, or 25k ones I usually post on here. The blue route is a much shorter distance (10 miles), but was a "hilly" and "high" route, whereas the one we chose was overall much flatter, keeping to the foothills, but was a lot more ambitious at 18 miles long. Last time we practiced a hilly route, we only averaged 1.7mph, so we calculated we could cover 10 miles at that pace. We had no idea how much we could cover on a more flat route, but hoped for as much as 3mph overall. So, we decided to try the flat route as an experiment, even more so because we would collect controls (and thus more points)than we would from the controls on the hilly route. We set off and as you can see, did an initial climb, following a beck (a stream) up the side of High Pike. When we thought we had got to the location, navigating only by map and compass, I confirmed it on the PDA/GPS I carried (I won't get to use any GPS in the real event of course). We then continued uphill to an old abandoned mine and the second control. 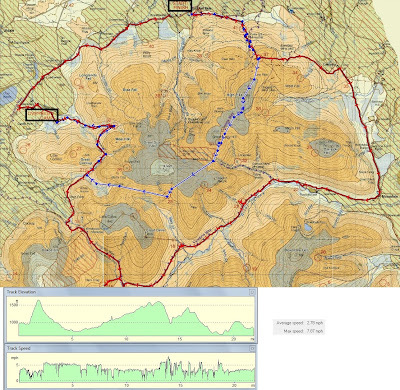 I then took over navigation from my girlfriend, and we then descended and picked up a wide trail and then decided to run for around 30 mins (as you can see from the speed profile). We picked up the next control by the road which contours the fells, and followed beside the road (pictured below) to a small village called Mosedale. Here we took a 10 minute walking break before running on again to pick up the next control (numbered 22). Here I took this from that position looking at the way ahead. Here, the last of the road before it ends. My girlfriend (gf) took over navigation again (we navigated two controls each, then swapped). About 1km after control 22, the gradient increased sufficiently for us to slow to a fast walk and continue onto the next control, 23, which was in a Sheepfold about 60m up a hill. It was a short sharp and fairly steep climb. That's my gf climbing up to me at the sheepfold. We continued on at a fast walk on the footpath at this stage to find control 18 at another sheepfold, where I took this looking back. This photo looking forward to Lonscale Fell in the far distance. This one looking up to Great Calva, which we didn't climb today. Just before the next control, 18, we passed near to Skiddaw House, a Youth Hostel, about 2.5 miles from the nearest road, nestled on the very low foothills of Skiddaw itself. Control 18 was a high value control and proved to be more challenging to navigate to across thick heather, very boggy ground, and crossing some wider streams, as well as about 100m in height from the previous control. This phot was looking up towards the control, which was another sheepfold about a third of the way up the hill. The weather took a turn for the worse at this stage and we had a short heavy downpour, just as we got back onto the Cumbrian Way footpath again. My girlfriend displaying her improving descending skills. We picked up the straightforward control 16, which was right on the path just near to my gf took this photo. We would be headed to the far right next. We went down into the valley and across a stream where I tore my brand new pair of waterproof trousers. They trousers are very lightweight, and clearly have no rip-stop material. I caught them as my leg brushed on a fence and they tore a 6 inch rip by the knee. I wasn't very happy at the durability of the trousers. 5 minutes later my girlfriend stumbled and caught her knee on a rock putting 2 small holes in her trousers too. We picked up control 21 by the delightfully named hill "Great Cockup" and then contoured around "Meal Fell", which my gf found tough on her ankles. I descended down to the CP which was by the stream between the fells and took this photo of her coming down. She had to take it a little easier as she had inverted her ankle so we couldn't run quite so much heading for the finish. We could have run a little more at the start I think. Anyway, as a result we got to the finish area in 6 hours and 4 minutes, so we would have had a few points deducted for being 4 mins late, but nothing serious. We had covered about 18 miles and average 2.8mph, with 2700ft of ascent. The speed was slightly slower than we thought, but overall we were very happy with and that information will prove valuable for planning our route on the actual event itself. We then had a 4.3 mile run/walk back to the car, so covered 22.3 miles and 3700ft overall that day. Not a bad days effort I thought. Back at the hotel we had a nice meal, which was even better as I didn't know it was included in the price of the room. I had booked a bed and breakfast rate, but when I checked in they said dinner was included. Bonus! If you are staying in Keswick I can recommend the Keswick Country Hotel, which despite the name is a stones-throw from the town centre, but has great views over the fells. In the evening we decided that rather than do a second day on the same map, we would drive down to the Howgills and run around there. We sat in a coffee shop in Sedbergh, and ate an early lunch and fuelled my gf with coffee, which is pretty important if you expect and sense or activity out of her. We planned the route as we ate. The little flags on the map are the random points that we would try and find, again using only map and compass, but verifying the location with GPS when we thought we had got there. It was already raining when we started and so once more the waterproofs were on. The weather was terrible all day. It didn't stop raining at all, and the cloud was quite low, plus it got quite windy up high. We headed up on a right of way until we crossed onto the fells and access land. We came across a favourite mountain talisman; the dead sheep skull. You can see the weather isn't very nice. This photo taken looking back, not forward, where it was worse! We then had a very steep scramble up a bracken covered hill to reach an old footpath. It was a lot steeper and harder going that it appears, our average pace pushed down to about 1mph. We then contoured around the hill, about half way up it, and headed deeper in the fells, following a stream and found our first location; a sheepfold. Here my gf heads higher and into the cloud ahead. After finding the first location by Sickers Fell, we then turned West and scrambled steeply uphill to join a marked footpath. By now we were totally enveloped in cloud. It was raining quite hard and was windy, and it was surprisingly cold. We navigated successfully (by pacing out 250m on a bearing) to a point marked "Rain Gauge" which now is just half a dozen pieces of smashed up wood on top of Arant Haw. We continued on in the worsening weather and were surprised to meet a group a people heading down. We thought we were the only people up there. We exchanged a joke about each thinking the other was bringing some hot tea to drink, before heading on. The wind really picked up and the rain came down harder, and I got flashbacks to the time in Tenerife where I thought I might not get back alive. Bad visibility, I am fine with, rain I am fine with, and cold weather I don't like, but I can tolerate. After that experience in Tenerife, when you put them all together now I get a little nervous. I was starting to feel cold, but the rain and wind was sufficient that I didn't want to stop and take off my waterproof jacket and take out a fleece out of my rucksack, and then put it all back on again. I should learn to just stop as soon as I start to feel cold and layer up straight away. At the time, I just wanted to keep on moving and stay warm. Now on top of the mountain around 2100ft we were able to run again. I decided to miss out one proposed location and head down to lower ground, as much to ease my rising stress, as head into less harsh weather. So we headed down on a narrow path initially, before it opened out onto a wide slope. You can get an idea of the conditions from this photo I took of my gf descending at this point. A couple of hundred metres lower down and we emerged from the thick cloud and regained some visibility. Stress levels dropped and returned to normal as the wind was lower too! We next practiced navigation more by pacing, this time 900m, and then using reverse compass bearings to triangulate our position. We established where we thought a sheepfold was a headed steeply downhill to find it. Me pointing back to where we had come from, some 400m above. The summit was way above the cloud layer, that's just a false summit you can see at about 300M in height. We then headed down into a valley, to another sheepfold, before another sharp climb up a gill and to a sheepfold that sat in the saddle between two hills. We were impressed with our navigation, it had been spot on all day. We then dropped down and hand-railed around the dry stone wall that surrounds the access land around the fells, finding a couple more controls and then emerging by Lockbank Far. 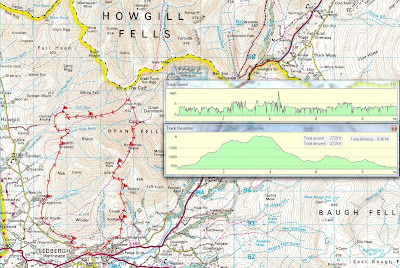 We covered 9.5 miles, 2730ft of ascent, in 4 hours and 15 mins; that's 2.2mph average. This is a slightly better average speed than expected. Overall I was very pleased with how it went. We both learned a few lessons and tested out various bits of kit and clothes. I have found my new Marmot waterproof gloves may not be very waterproof after all, and that my North Face waterproof jacket needs re-proofing. I am doing the 22 mile Hills and Dales event this weekend. I am looking forward to it. Have a god week!